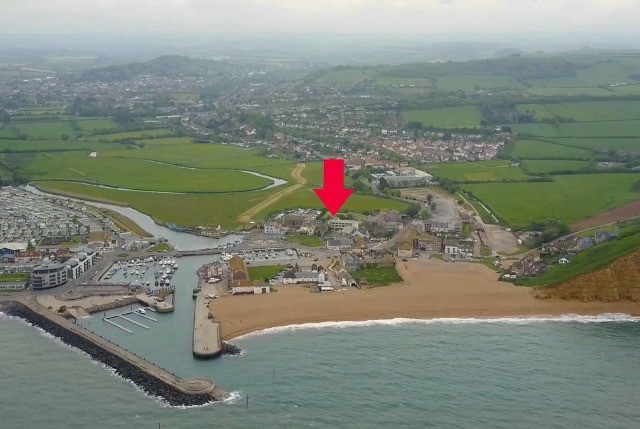 Here’s a photo of West Bay Harbour and East Beach taken from the air. Swains Row is almost hidden behind Harbour House but I’ve added an arrow to show where it is. Can’t miss it! Incidentally, I got the still photo from a YouTube video. Please have a look if you’d like to see the drone footage over West Bay and the nearby Jurassic Coast. It gets much sharper after the first 15 seconds or so. Beachcombing West Bay Rock Fall June 2017 Simon Calder’s Five Top UK Seaside Resorts West Bay is Snooty-on-sea (apparently)!